The StrategyDriven Professional establishes a clear personal vision, embodies inspiring values, and aggressively strives to achieve his or her goals. This commitment to excellence is reflected in the professional’s every decision and action; enabling him or her to outperform those others not so committed. 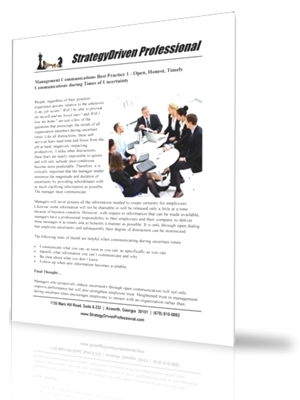 StrategyDriven Professional is therefore dedicated to providing the personal and career development advice, tools, and practices needed to accelerate our member’s careers and personal goals achievement. But don’t believe us… believe the numbers. 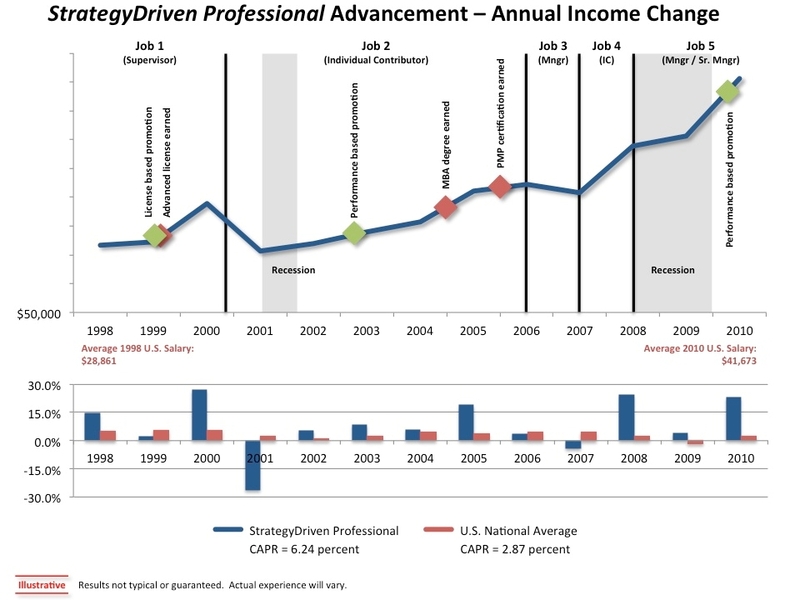 In our experience, a StrategyDriven Professional achieved a compounded annual percentage rate (CAPR) growth in income of 6.24 percent1 between 1998 and 2010 as compared with the U.S. national average of 2.87 percent2 – more than double that experienced by the average worker and substantially higher than the rate of inflation3 ! StrategyDriven Professionals aspire to achieve and contribute more than their current station dictates. They are driven by the opportunity to be and do more. These professionals constantly prepared themselves for the work to be done today and the opportunities that may present themselves tomorrow. StrategyDriven Professionals relish a journey that requires hard work and dedication, one in which success is not guaranteed and is not always achieved but is worthy of their efforts. In some instances, these individuals knowingly accept setbacks for personal reasons or to eliminate barriers to their long-term future growth and achievement. Individual career aspirations are uniquely different and increasingly difficult to achieve in today’s hyper competitive workplace environment. At the StrategyDriven Professional, we believe creating an actionable, forward-looking strategy to achieve one’s professional and career goals is critical to success. Such a plan ensures an individual’s limited resources focus on those specific activities needed to excel and are not expended on less worthy endeavors. The StrategyDriven website provides advice, tools, and techniques to help members create their strategic career plans as well as develop themselves as inspiring leaders and effective managers. Our materials represent tried and tested business world methods based on years of professional and career development experience and are founded on solid research and academic principles. We provide readers with the best practices needed to create the high level of personal performance and achievement characteristic of world-class professionals and introduce warning flag behaviors and environmental factors that signal a retreat from standards of excellence and represent a threat to personal goal achievement. Our framework for achieving personal excellence not only addresses individual job performance but also serves to develop the leadership and management acumen needed to advance to ever increasing levels of organizational responsibility. We also address the selection and of and relationships with mentors and coaches; individuals who play a vital role it the overall growth and development of every successful professional. Collectively, our recommended practices focus on helping you achieve your personal and professional goals while concurrently supporting your organization’s success. Become a StrategyDriven Self Guided Library Member. The membership is FREE Forever with No Credit Card Required. 1. Illustrative example based on Medicare wages and tips as reported by the U.S. Social Security Administration for a coached professional. Results not typical or guaranteed. 2. National Average Wage Indexing Series obtained from the U.S. Social Security Administration. 3. U.S. inflation rate based on the average annual change in the Consumer Price Index as reported by the U.S. Department of Labor, Bureau of Labor Statistics.